A hyphen is just a little dash – except when it’s not. Almost a century ago, when the Kennel Club in the United Kingdom changed the name of the Bull-Mastiff to the Bullmastiff, it was no trivial technicality: It signified that the Bullmastiff had finally shaken off its traditional designation as a hybridized mishmash and ascended to the status of a genuinely unique purebred. 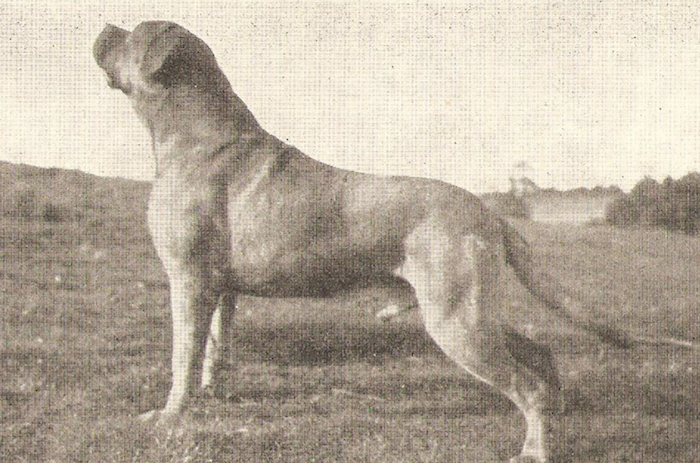 “This powerful and symmetrical dog only assumed a definite identity as recently as October 1927 when the Kennel Club Committee agreed that Bull-mastiffs (purebred) should be added to the Non-Sporting section of the register and the first championship show at which classes were provided was that of Crufts in 1928,” wrote Croxton Smith in Dogs Since 1900, his mid-century compendium of recognized breeds. Sounds clear cut, but like much purebred-dog history, the real story didn’t quite match the neatly gift-wrapped official version. In 1928, the same year the Bullmastiff was recognized as an official breed, the Marquis of Londonderry sent this youngster to be exhibited at the famous Crufts dog show. Shortly after being accepted by the American Kennel Club, the fully fledged Bull-Mastiff was featured in the July 1934 Gazette. The article opened with the author’s childhood recollections of the breed in Ireland during the 1880s, emphasizing the surprisingly consistent temperament exhibited by those old-style dogs, despite their eclectic ancestries. Stable behavioral traits coupled with physical diversity obviously didn’t jive with the modern framework of purebred type. It was however, quite typical for countless functional working breeds. Traditionally, the selection process prioritized the traits necessary to get the job done. Bullmastiffs might have been all over the map in terms of appearance, but the breed’s utilitarian temperament was chiseled in stone: loyalty, courage and hardwired dedication to protect home turf. And for centuries, that worked just fine. Conformity of appearance and documented lineage were irrelevant until the mid-1800s, when Western culture rewrote the rules. Mastiff/Bulldog combinations dated back to prehistory, and from the get-go the Victorian era’s new dog-breeding rules raised some significant questions regarding the actual goal of Bullmastiff modernization. This was more complicated than simply separating and documenting various bloodlines. An entire class of traditional breeds fell within this vaguely defined category. Their stand-alone status was contingent on diverse factors, specialized function, regional preferences and a few outstanding physical features – but even those parameters were pretty flexible. The possibility of melding this multifaceted conglomerate into a single uniform type seemed absurd. Ch. Roger of the Fenns. Every Bullmastiff alive today has him somewhere in his or her pedigree. Reflective of the rather loose breeding practices of the day, Roger of the Fenns also appears in some Mastiff pedigrees. Rhodian, an impressive Bullmastiff from the 1940s. In addition to these heavyweight opinions, there was plenty of tangible evidence supporting the breed’s validity. Bullmastiffs were in the picture from the start of formal dog shows. For instance, four years prior to the formation of the Kennel Club, six were exhibited in a class for Yard or Keeper’s Night Dogs at the 1871 Crystal Palace show. Maybe not so beautiful, according to Vesey-Fitzgerald, but definitely present and accounted for… and gaining traction by the turn of the century. Robin Hood of Le Tasyll, whose paternal grandfather was Rhodian. Like all Bullmastiffs, he has Roger of the Fenns in his pedigree, on his mother's side. Famed British Bullmastiff breeder S.E. Moseley didn’t mince words on the importance of that date when he was quoted as “the pioneer of the breed as it is today” in that AKC Gazette article. “There is no use tracing them farther back than 1924 because one will only find the crossbred,” asserted Moseley, who has been attributed with the magical 60 percent Mastiff/40 percent Bulldog formula that . Time-tested cross – or newfangled British breed? We could still argue the point. But regardless of how, where or when the Bullmastiff got here, it’s here to stay. Click here to read about S.E. Moseley’s role in the formal formation of the Bullmastiff – and the controversy surrounding him.